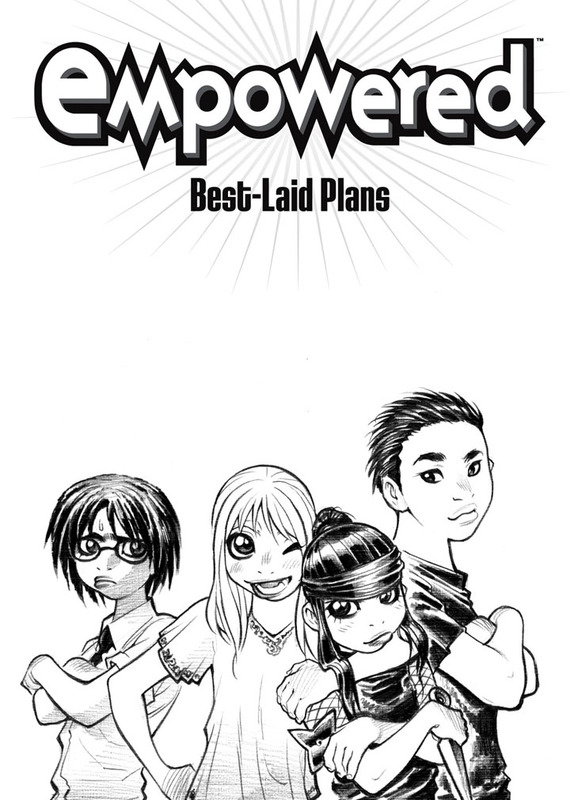 This title-page illo kicks off another of Empowered vol. 1’s very, very short chapters—in fact, the story that follows this is only two pages long! Yikes! Nowadays, I would almost certainly use a vignette this brief as a mere “cutaway” scene folded into a longer story. Still, on some level I’m kinda fond of the “start-stop” choppiness of these early installments in the series, back when I was still throwing stuff against the proverbial wall more or less at random. In retrospect, I’m glad I got the chance to play around with the characters and situations in such a carefree, spontaneous fashion before gradually developing them into long-form arcs and narratives, rather than having to force them into “real stories” from the start. Minor art-critique time! If you look closely at Future Sistah Spooky and remove her school uniform’s collar—though only its collar, you pervs!—in your mind’s eye, you’ll notice that her neck is actually quite a bit too long. That’s because I drew Spooky with her clothing as an integral part of the drawing, rather than taking the more idealized artistic approach of drawing her as first as an unclothed figure, then adding the school uniform afterward. The latter technique is certainly more artistically sound and lends itself to superior construction, but here in the real world where a comics artist needs to crank out artwork in a hurry, we time-pressed hacks rarely have time for such niceties. For example, so sane human is gonna draw a crowd scene first as a mob of nekkid people, then carefully and painstakingly—and correctly—draw in clothing over their bodies. The trick, I think, is to try and figure out ahead of time the weak points in your figure-drawing repertoire where clothing-integral construction will lead you astray, and then take care to use “proper” drawing techniques in those specific situations to avoid blunders. For me, the “collar causes an overlong neck” issue is definitely a recurring one; many of my drawings of Ninjette’s costume, with its big ol’ “floppy turtleneck” collar, stumble headlong into this abyss of incorrectness, as I’m often drawing the poor girl with what must be a ridiculous, swan-like neck hidden underneath that cloth. Note my flailing stab at depicting Future Thugboy with some vague indication of epicanthic folds to reflect his half-Japanese heritage, as mentioned in an earlier story. Sadly, I’m just not very good at this sort of “semi-realism,” though I take a bit of comfort in knowing that most “real” manga artists are just as incapable of such a depiction. Whew!